This time for Once Upon a Time, I'd decided to read some of those books that I find people from other corners of the world raving about, starting with The Princess Bride by William Goldman. I spent my childhood reading an assortment of fairy tales, then Enid Blyton, later Harry Potter and the occasional Roald Dahl. I can't say I enjoyed many classics. For the last couple of years, I tried my hand at all the books, especially fantasy, that fellow readers read as they grew up - from modern authors like Diana Wynne Jones to good oldies like C. S. Lewis. 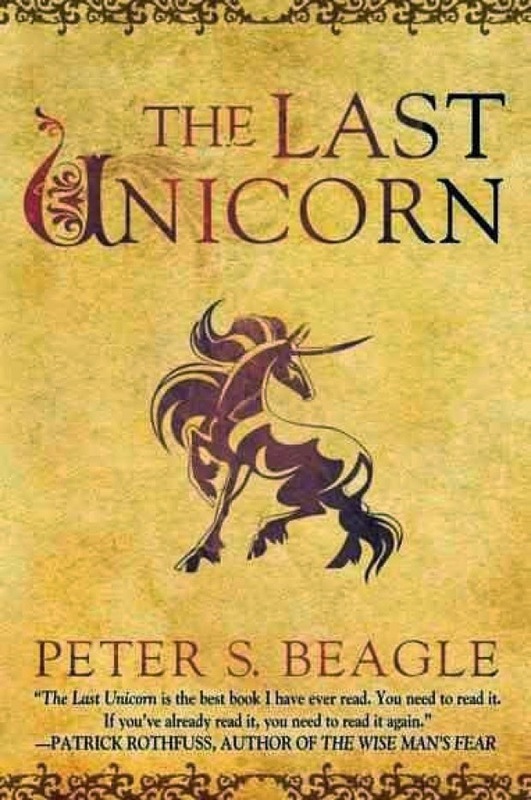 So with that in mind, I decided to read The Last Unicorn by Peter S. Beagle. 1. There's a horrible king, a curse by a wicked witch, there's a wizard and a forest full of magic, and then you have an immortal unicorn. But this book is still not your typical medieval fantasy. When the last unicorn in the world sets out one day to find out where the rest of her kind went, she is trapped by a travelling carnival of sorts, where she is displayed along with other creatures, a lion magicked into a manticore, a poor dog disguised as the mighty Cerberus; a spider tricked into believing itself Arachne, a magician who can't control his magic and a real harpy. But the unicorn is freed by the not-quite magician Schmendrick, who accompanies her on her quest to find the Red Bull, who has chased all the unicorns out of the world. The twists and turns make the story enchanting, but it's most rare because it knows itself, it's an unusual fairy tale that is self-aware. The true secret in being a hero lies in knowing the order of things. Things must happen when it is time for them to happen. Quests may not simply be abandoned; prophecies may not be left to rot like unpicked fruit; unicorns may go unrescued for a very long time, but not forever. The happy ending cannot come in the middle of the story. 2. But then, it also has tradition. It has rhyme; songs and ballads; at one point, it has Robin Hood, though we all know he's not real. There are singing birds and a butterfly who can make sense of nothing but poems his whole short life. There's Madame Fortuna, who runs a carnival and sings the song of old age. What is gone is gone. Who has choices need not chose. We must, who have none. 3. And it has descriptions that make you heady. Her neck was long and slender, making her head seem smaller than it was, and the mane that fell almost to the middle of her back was as soft as dandelion fluff and as fine as cirrus. She had pointed ears and thin legs, with feathers of white hair at the ankles; and the long horn above her eyes shone and shivered with its own seashell light even in the deepest midnight. Outside, the night lay coiled in the street, cobra-cold and scaled with stars. Men have to have heroes, but no man can ever be as big as the need, and so a legend grows around a grain of truth, like a pearl. The sky was still black, but it was a watery darkness through which Schmendrick could see the violet dawn swimming. Hard silver clouds were melting as the sky grew warm; shadows dulled, sounds lost their shape, and shapes had not yet decided what they were going to be that day. Even the wind wondered about itself. 4. But it's not only the imagery that grips you. It has characters so real you'll find yourself in them. They are human, and I guess unicorn and wizard and eccentrically butterfly, but even in their dissimilarity, you find what it is to be human. You could owe it to the narrator who makes all characters unlike your fantasy tropes. Prince Lir, the hero, is valiant as only a prince can be, and he's compassionate, but you're not told it. As a hero, he understood weeping women and knew how to make them stop crying - generally you killed something - but her calm terror confused and unmanned him, while the shape of her face crumbled the distant dignity he had been so pleased at maintaining. When he spoke again, his voice was young and stumbling. 5. But more than anything, it has insight. Such great insight into people, mortality, selfless love and dwindling belief; that you wonder how a kid is supposed to understand it, then you realize he would and then you recognize that the book is right up there with the bests of fantasy; the books that tuck away great meaning under layers of intrigue, so that when you're done, you're overjoyed and also kind of melancholic, and filled to the brim with thoughts you wouldn't have imagined an entertaining adventure could bring to mind. I only read this one in the last year or so myself. I do enjoy how it presents so many of the traditional elements of fairy tales...but is so atypical in how it presents them at the same time! Cheryl - You're right, that's exactly what it does. Thanks for stopping by! "Men have to have heroes, but no man can ever be as big as the need, and so a legend grows around a grain of truth, like a pearl." Wow, clearly I must read this book. I'd never heard of it until recently and then in quick succession I've read three really positive reviews and not all for OuaT! I must put this on the list. Hehe it is nice to be back! And hehe I cant wait to grab it. I'm currently reading the wind in the willows..oh I love that book..bursts into song in the middle..
Priya, the review is excellent. I really feel like grabbing a copy of this one. A very passionate recommendation. I think I'll link everyone to your review when I see people wondering about whether they should read The Last Unicorn. Well said! This is one I've been meaning to read for such a long time. I really must get to it. katenread - Thanks! But unfortunately, I can't access the song where I am. :( I would have liked to listen to it.. but thank you for the link.